It was my first journey abroad, and I must say, it was the best journey I’ve ever been on. As per an invitation sent to our university by MMDU (Maharishi Markandeshwar Deemed to be University), Ambala, India, I set on my little expedition on the 17th of June, 2018. 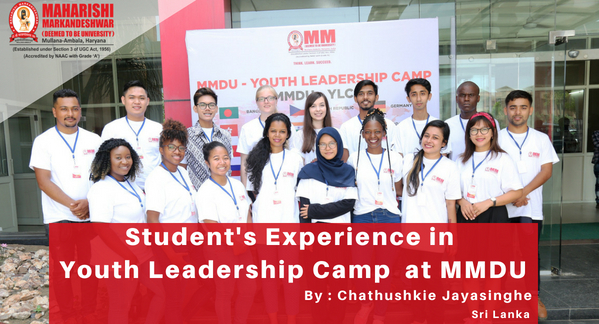 It was for a 6 day Youth Leadership camp that promised an unforgettable experience of fun, knowledge, and entertainment. After stopping by Chennai and Delhi for my transits, I finally arrived at my destination “Chandigarh”, on the 18th of June. And what a stop it was! I was picked up and warmly welcomed by officials of MMDU, and this hospitality did not hinder till the end of the camp. A little background check told me that Chandigarh is still a young city. To aid your imagination, I’d like to compare it to Sri Lanka’s Trincomalee with its heat ( nearly 45 Celcius degrees) and the never-ending highways. It also reminded me of Katharagama with its spirituality and the exceptional greenery midst the heat. The mountains of Himachal Pradesh was visible at a far distance and we passed fields of Maze and Rice. It was where the village met the city; a small paradise in a desert. I thought how similar the environment and people were to that of my own. I felt right at home. The Camp commenced with an inauguration ceremony and a small gathering where I was able to express my ideas and meet my mates for the week. I was immersed in a diverse culture of 13 countries. Nearly 20 delegates from countries all over the world; Indonesia, South Africa, Germany, Nepal, Madagascar, Malawi, Bangladesh etc joined together in one university that was immediately converted to a cultural hotspot. As a student of Literature studying Linguistics, I enjoyed applying knowledge practically on their languages and their dialects. As a former student of Anthropology, I was able to deepen my scope on various races, cultures, and mindsets. I was able to mingle among them much easier and make a family out of them. As scheduled, each day started at 6.00 am, with either a session at the gym or a by playing a sport such as Badminton, Squash or Table tennis. The most exciting morning of the week was when we became invitees of the International Yoga Day celebration in India. We became the celebrities for the day, performing yoga in front of 1000s of Indians. This feeling extended later that day when we were interviewed by a National Television channel. Moving on, almost half of some days were spent on lectures. This may not sound very exciting but believe me, it was. They were full of activities and laughter but at the same time, they were extremely educational. We were taught many aspects of Leadership: Self-improvement, decision making, positive interdependence, Abundant mindset, SWOT analysis and the like. These were presented by intellectuals of fields ranging from Mass Communication, Authors to TedX Speakers. Thanks to these personalities my knowledge on Leadership was greatly elevated as I left the camp. Education aside, we were taken on tours around Chandigarh. The observations I made and the experiences I faced are for a lifetime. We spent a night at Kurukshetra, where the mortal combat of two rival armies took place as stated in Mahabaratha. We visited the Sri Krishna Museum, an adjoining Science Museum, Brahma Sarovar, and Jyotisar. Each of these places catered a unique sense of knowledge, spirituality, and Culture. Next, we visited the Elante Mall- the largest mall in North India, the Rock garden- a massive creation made completely of waste material and the peaceful Sukhna lake. Gallons of water were consumed, hours of time was spent traveling, and it was all worth it. A special note has to be made on the Indian Cuisine that caught me with great surprise. Vegetarian food would definitely not appetize someone like me who craves a bit of chicken twice a week in the least. Yet the Indian dishes that I tasted made me forget that meat exists! Kheer was my favorite dish. Naan and Shahi Paneer tickled my taste buds too. Ranging from spicy to sweet, the food was simply fantastic. They say that every good thing must come to an end, and so did this. Cultures swapped, Leadership gained, friendships made, I was the first to leave Chandigarh on the 23rd. As homesick as I was to return to Sri Lanka, I was nostalgic at leaving behind such a vibrant place and such beautiful people that’d soon be distributed all around the globe. Promises were made to keep in touch and I left Hindustan, the land of Gods, with a heart full of cherished memories. Nicely expressed and I loved reading it. Good job. Keep it up. We need more sensible writers in Sri Lanka. Wish you good luck Chathushkie. Thanks for sharing superb information. Your site is so cool. I’m impressed by the details that you’ve on this site. It reveals how nicely you understand this subject. You, my pal, ROCK!